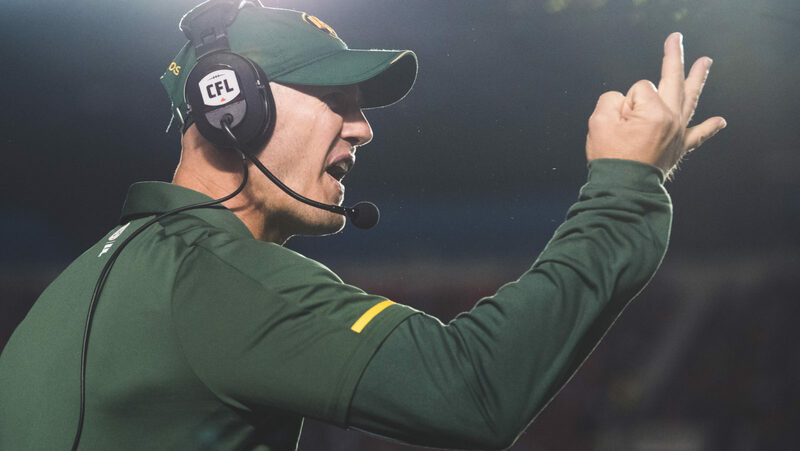 EDMONTON — Any speculation swirling about Jason Maas’ future as head coach of the Edmonton Eskimos was seemingly put to rest Wednesday night when the he said that he was going to continue as the club’s sideline boss on the ‘Esks Coaches Show’ on 630 CHED. The weekly radio program kicked off with Maas responding to a question regarding his year-end meeting with general manager Brock Sunderland where the former quarterback said, “Brock and I sat down and digested everything for about eight hours, and at the end of it, we came to the conclusion that I am going to go forward and coach the team. Questions regarding Maas future with the club began as the Eskimos cleared out early after a disappointing 9-9 season, one where they went from potential Grey Cup contentders to missing the playoffs in a year where they were to host the Grey Cup. After confirming that he will return as the sideline boss in 2019, Maas also stated that there was a chance he would relinquish the offensive coordinator duties. With Maas remaining, many wonder how that will play into whether or not star quarterback Mike Reilly will stay in Green and Gold. Reilly is a free agent and didn’t give any indication as to if he was considering leaving Edmonton in the off-season. “Right now I’m an Edmonton Eskimo and that’s really the only thing that I’m comfortable talking about to be honest with you,” Reilly told members of the media at the team’s final media availability of the season on Sunday. “I’ve had a great six years here and if it continues here, I’ll be lucky to have that opportunity, of course.